Jane is a founding Partner and senior consultant with Meridian with more than 30 years’ experience in all areas of executive and director compensation. She consults with compensation committees and senior leadership on issues such as proxy advisory firm policies and engagement strategies, Compensation Committee process and governance, pay-for-performance comparisons, compensation strategy and pay amounts. Jane’s clients include companies in the food, tobacco, business services, media, distribution, aerospace & defense, transportation, and utility/power industries. Jane is a frequent speaker and author. Topics include flaws in ISS’s and Glass Lewis’s Say on Pay voting policies, pay and performance analyses, pay for non-CEO Board Chairs and comparisons of Relative Total Shareholder Return plans to stock options. Jane began her career as a tax CPA at Arthur Andersen & Co. and taught in the M. S. Taxation program at DePaul University. 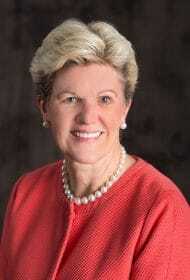 She spent 25 years with Hewitt Associates LLC in its executive compensation practice and was a member of its leadership team, also serving on Hewitt’s Executive Committee.